As you zig zag through the pine plantation at Inverlael on wide paths, you could be forgiven for thinking this leg is going to be easy. As you clear the forest, the path becomes steadily boggier and less distinct before dissapearing completely. The key here is not to drop too far down towards Allt na Lairige - it's a boggy horrible mess that will destroy your spirits early in the day. In low visibility, you'll need to be on your game with navigation as you contour and descend into Glen Douchary. The floor of the glen is rough going so aim for the ruins at NH 244 901 (marked on OS 1:25 000 as sheepfolds). You should be able to cross the river relatively easily here. However, if the river is in spate this will be a very difficult crossing and you may have to backtrack much further up the glen to cross safely. If you think the river will be high, it may be better to drop into the glen earlier. A track is marked on the map that follows the east side of the river along Glen Douchary, but it is very faint and rough going. Glen Douchary itself is stunningly beautiful and much of its flaura and fauna is unique. This makes it all the more depressing that the estate have chosen to carve a shockingly ugly 4x4 track across the side of one of Scotland's most beautiful glens. Once you cross the river and climb up towards Loch an Daimh, the worst is over. You may be forgiven for calling an early halt to the day and stopping at the bothy at Knockdamph (NH 286 954). If you continue, the paths are clear and good, becoming 4x4 tracks as you progress towards Oykel Bridge. There's another bothy at Duag Bridge (the schoolhouse NH 340975). Oykel Bridge centres around the hotel (a friendly and welcoming place that is a welcome refreshment or stopping point), but there are camping spots further up the river if it's out of your price range. 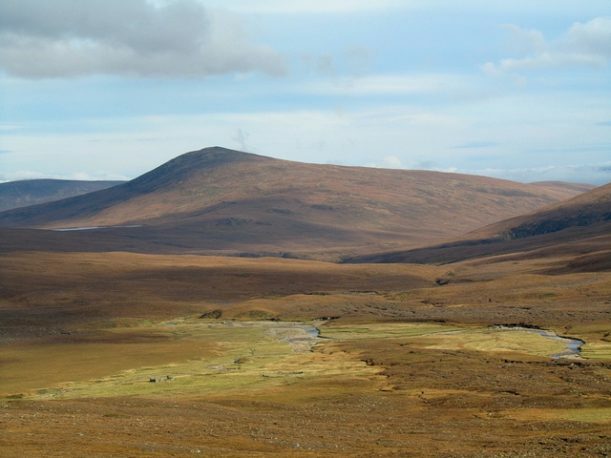 If you visit Ullapool, there's an easier route alternative that heads out from the back of town towards Loch Achall and follows the Rhidorroch River to join the main route at Loch an Daimh. It's 4x4 tracks almost all the way and pleasant enough country. If the weather is foul or your legs are suffering this is a good alternative to an otherwise taxing leg. For the truly adventurous, you could follow in Paterson's footsteps and strike out from Ullapool into the dark heart of Assynt - for more information see this blog post. A comprehensive guide to the Cape Wrath Trail, one of the most challenging long distance walks in the UK, published by Cicerone and now in a fully updated Second Edition.